We end up the month with a few gifts from Wyrd for Malifaux. Today they released the PDF for the Rules Manual if you haven’t picked up the book yet so you can get that at the link below. Also with that they have released their Gaming Ground document which is the Tournament Rules they have been working on for a while. 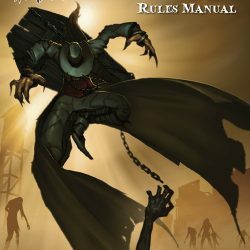 We told you about the important rules updates that occurred with the Rules Manual, and many of you have seen this book at your LGS and used it to play even more Malifaux games. To go along with these updates, we want to ensure that all Malifaux players have access to the official rules so that you can avoid disputes in your gaming groups and just have more fun. So we’re providing a PDF download of the Rules Manual. Some core items have been removed. To get all the information, you’ll still need to buy the book. But if you’re just looking for all the information, updates, errata, and FAQ in one file, this PDF will help. Gaming with your friends isn’t enough? You’re ready for some full-fledged Scraps and Brawls, maybe even with prizes? We thought we’d provide that for you also. Gaining Ground 2011 is a PDF with all the information you need to take the rules and have a tournament. So grab your deck and Cheat Fate! The tournament rules are quite full on in many ways. No proxies is the biggest issue for me. If I was running an event I can choose not to use that rule even though I’m a henchman. But for Wyrd running one at Gencon it will follow those rules.